All boaters have heard this mariners's proverb or similar ones. They have a salty flavor that takes us back to the era of sailing ships. In this seminar students will learn the meteorological basis for them. 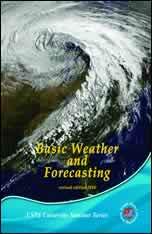 Basic Weather and Forecasting and Weather for Boaters cover the same subjects. The first is a squadron-run seminar given by an instructor in a classroom setting and the second is an online seminar that can be taken at home via the Internet. Both versions have enhanced graphics with video and audio clips. For the Basic Weather and Forecasting seminar the Instructor CD and hardcopy full-color Student Reference Guides should be ordered by squadrons from National HQ in the regular way. 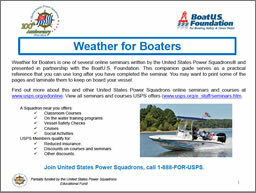 The Weather for Boaters online seminar includes a downloadable Reference guide.